Listen To Bob's Story Here. A non-profit technology institute in Pensacola is set to begin a major expansion of its downtown campus. The Florida Institute for Human and Machine Cognition owns two acres of land bordered by Alcaniz, Romana and Flora Blanca Streets and is looking to bring its operations around the city together. 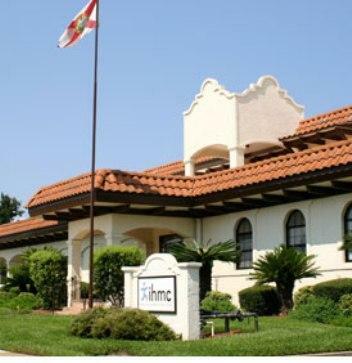 The Florida Institute For Human and Machine Cognition building on S. Alcaniz St.
Julie Sheppard,General Counsel for IHMC said the institute is spread out in four rental properties around town as well as in its main building. They are looking forward to consolidating everything on their downtown campus. The non-profit institute is involved in cutting edge research and development projects involving, among other things, artificial intelligence, robotics and exoskeletons, cyber security and computer-mediated learning systems. To meet the unique needs of the institute and consolidate its staff on campus the building will be a three story, flexible structure that will fit into the historic feel of the neighborhood and the modern needs of the people working there. It will be designed so walls and rooms can be rearranged to fit the specifications of each new project. They will also will take advantage of the added space by making labs visible to tour groups by using glass walls and ceilings so the work can be observed without disturbing or interrupting the scientists involved. There have already been meetings with neighborhood groups and the city's architectural review board and there have been considerations taken for any possible archeological issues that may arise from the construction. Julie Sheppard says that being downtown is a big recruiting tool for the institute so they did everything needed to remain in downtown. Work is slated to begin on the first part of the project in the spring. That's an expansion of the IHMC meeting hall which is used for full staff meetings and the institute's popular lecture series, as well as hosting meetings for civic organizations and non-profits around the Pensacola area. The hall currently seats about 120 and will be expanded in the existing building. The completion of the 30 thousand square foot three story main project is expected by summer of 2015. The semifinals of the Defense Advanced Research Projects Agency’s Robotics Challenge will take place this weekend. The Institute for Human and Machine Cognition and other teams are programming robots to operate in disaster situations. A researcher from the Institute of Human and Machine Cognition (IHMC) was awarded the 2014 Gardner-Lasser Aerospace History Literature Award. The award honors the best original contribution to the field of aeronautical or astronautical historical non-fiction literature published in the last five years. IHMC Robotics rode a strong second day in the DARPA Robotics Challenge (DRC) to finish in second place overall in the second phase of the international robotics competition. The team from the Institute for Human and Machine Cognition in Pensacola was up against 16 of the best robotics development teams in the world.